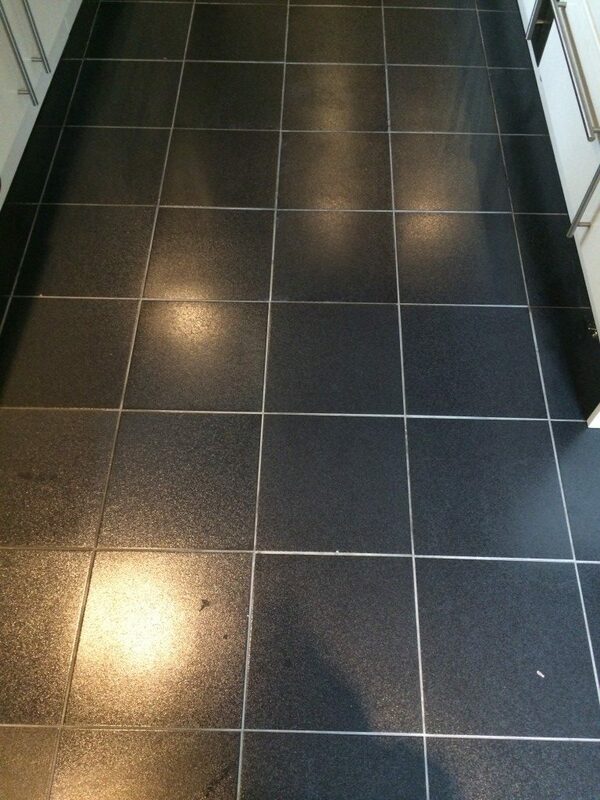 Tile & Grout Cleaning in Essex & London | Cleaning Bros Ltd. 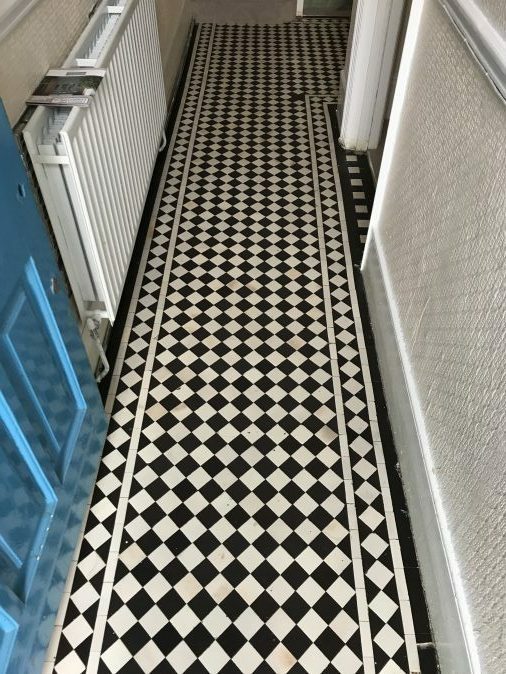 If you’re looking for a highly trained and locally trusted floor care company that offers tile and grout cleaning in Essex & London Areas, Cleaning Bros are the team for the job. From monthly cleans through to full tile and grout cleaning & restoration, we can offer a customised package to fit around your needs. At Cleaning Bros, we understand how important it is to keep your tiled floors and walls in a pristine condition, and how difficult a task it could be at the same time. Grout has porous structure so it can easily allow dirt, grime and grease to penetrate it, which will spoil the overall appearance of your premises. As we’re accredited by The Approved Carpet Cleaning Association, SafeContractor, The NCCA and Check-a-Trade, you can rest assured that when you choose Cleaning Bros as your tile & grout cleaning company, you’re going to be provided with a first class service from a reputable and professional company. And, most importantly, you’re going to see great results. Our tile and grout cleaning service is available on one-off basis as well as regular. Periodic planned maintenance of your tiled floors will actually extend their life saving you money in the long run on premature replacement. This will also avoid unnecessary disruption to your premises caused by floor replacement. We always advise our clients to rather prevent than cure issues. Regular care for your tiles and grouting lines will also make your home more hygienic and improve the indoor air quality. It has been possible for some time now to have your grouting lines re-coloured, which will not only make it look like new again, but will also seal your grout. Grout re-colouring comes particularly handy when the grout lines won’t clean uniformly, a common occurrence with old grouting. 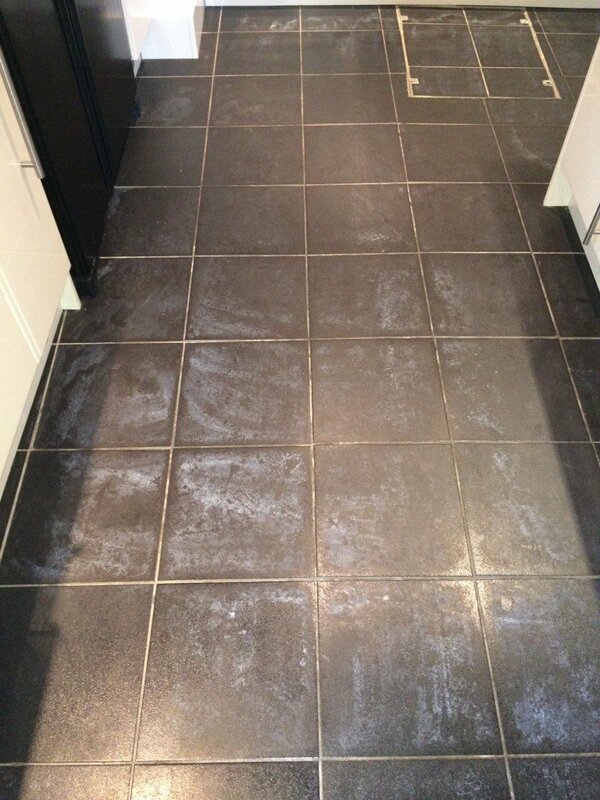 Our grout colour seal service gives 10 years of protections against discolouration caused by humidity. It’s suitable for both bathroom and kitchen tiles as well as wall tiles. Cleaning BROS use the very latest technology in tile and grout cleaning and sealing ensuring first class service is carried out. We only use leading brands cleaning products such as Prochem and Chemspec which gives us the confidence that we can achieve the best results possible in a short space of time. A scrubbing machine with a rotary brush attached to it is used to agitate the cleaning solution and break through the grime and grease. 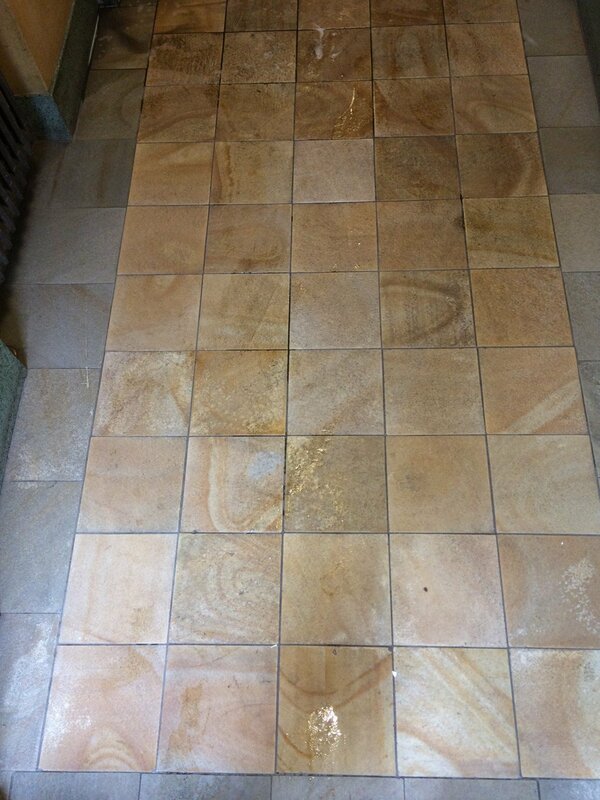 The formed slurry is then extracted away using our state of the art tile cleaning unit that produces very hot steam. 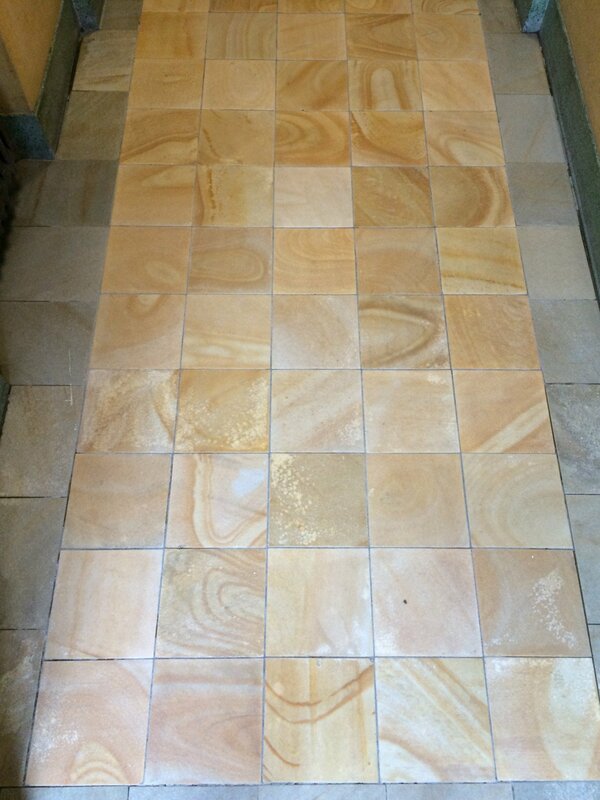 We can help with your ceramic tiles, porcelain tiles, terracotta tiles, quarry tiles. So, if you’re looking for a trusted team that provides tile and grout cleaning in Essex & London areas, call us today for free advice call Cleaning Bros now on 01708 701 973. These pictures are showcasing a kitchen tile floor where customer has used improper floor cleaner damaging the floor sealer in bad way. We had to strip the floor a few times to remove any excess sealer and then we neutralised it before re-sealing it. As you can see, the transformation is pretty incredible, with the tiles now looking brand new and the grout spotless and clear. We have come across these tiles recently found in a building in Belsize Park, London. The floor has been down for several decades with no proper maintenance in place so the tiles and the grout joints were quite grubby. We cleaned and sealed them with an impregnator sealant providing an excellent protection against water- and oil-based spills as well as dry soils that are tracked into the building. As you can see from the pictures below we managed to achieve quite a difference cleaning the tiles and grouting and our client was over the moon. 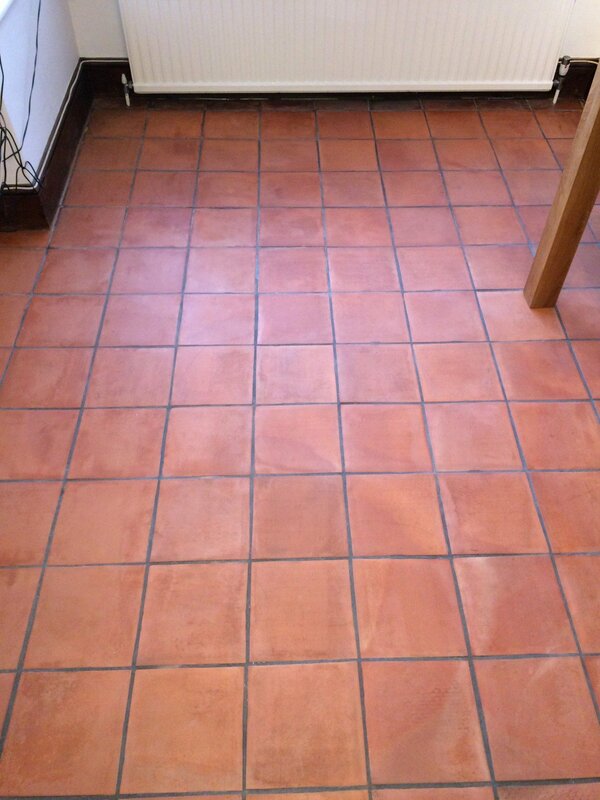 Terracotta tiles cleaning & restoration is a specialist service that requires knowledge, experience and high quality equipment, all of which we at Cleaning Bros possess. This tile is so porous that when unprotected, spilled liquids vanish before your very eyes in the matter of seconds. This is why it’s so important that the right cleaning products are used so they can sit on the surface and do their work. 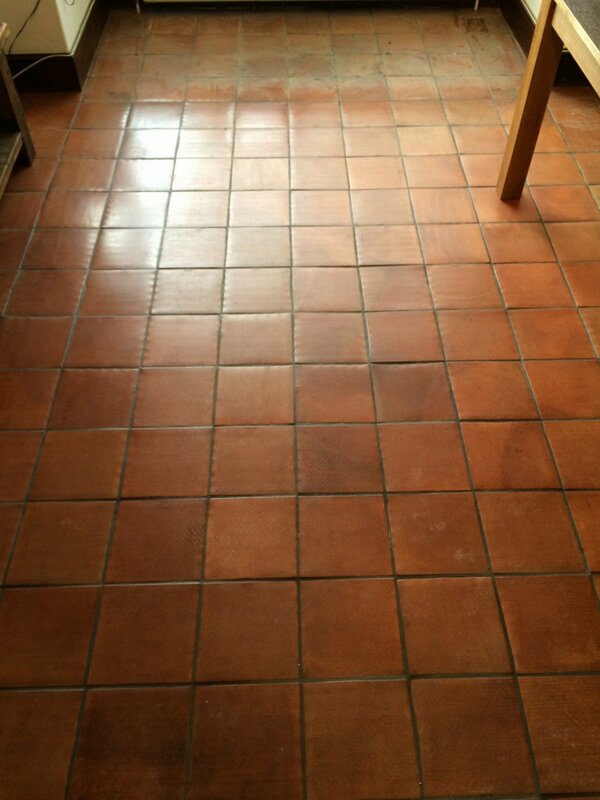 In this particular case, we have dealt with 35 years old floor that had a few layers of topical seal. We had to first strip the old seal off which, to put it mildly, proved to be very difficult. 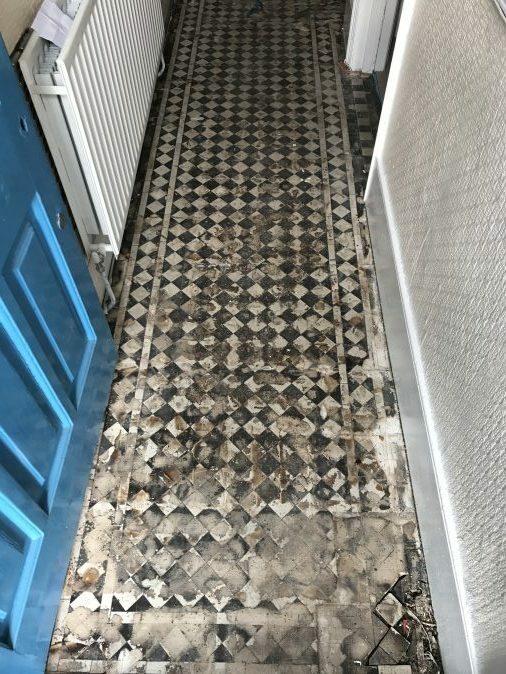 This beautiful Victorian tile floor was found by our client when he bought his house in London and decided to get rid of the carpet in the hallway. The floor was covered in glue and the general cleaning company our client initially hired failed at their attempt to “clean” the floor. Of course, cleaning alone wouldn’t even touch the glue so full restoration was required. We had to strip the floor of the glue and existing sealer, thoroughly clean it and then seal it. We also had to remove the gripper rods which proved to be very hard a task due to the strong adhesive used. In the end out customer was over the moon and quite frankly couldn’t believe the transformation.